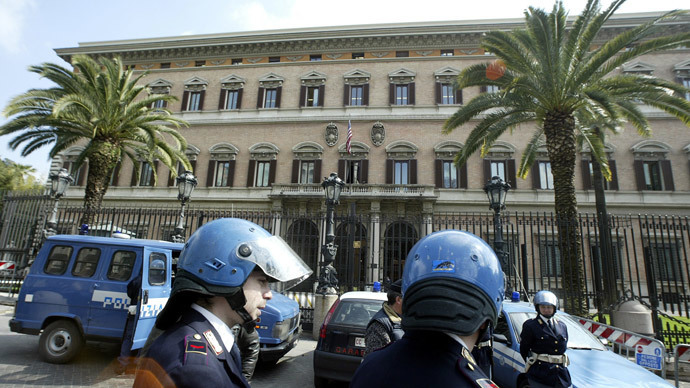 A group of alleged fraudsters has appeared in court in Rome after an ambitious attempt to sell US Embassy and United Nations buildings in the city at a price of 1.3 million euro to a German businessman. Wolfang Kroll, described as an “entrepreneur,” and his three “business partners” were charged with fraud and forgery. Besides Kroll, the cast of the alleged drifters included Donato Perazzolo as a bank manager, Walter Baccini as a fake official of the Interior Ministry, and Anna Lisa Morganti in a role as yet unknown to the court. Morganti’s lawyer has said that her client was innocent of any charges, and said the defense had provided evidence to the court proving Morganti was not involved in the scam, Corriere della Sera reported. The story began in 2008 when prosecutors say Kroll represented himself as a luxury property broker to a German businessman and offered to arrange the acquisition of the Porte di Roma shopping mall in Italy’s capital for a fee of 400,000 euros. With the help of his “business partner,” Donato Perazzolo, in the role of a “bank representative,” Kroll managed to persuade him to transfer 400,000 euros, prosecutors say. Another attractive offer was the headquarters of the UN food agency, the FAO, a white-marble building complex, which was built on Mussolini’s orders to house his fascist government’s Ministry of the Colonies. These two building were “on sale” for 580,000 euros and 600,000 euros, respectively, the prosecutors claim. The offer apparently did not raise any suspicions and the buyer, seduced by the discount price or impressed by the talented acting of Kroll’s “business partner” Walter Baccini, who was brought in to impersonate a government official, transferred another 900,000 euros to the group, before it dawned on him that the deal was too good to be true, Corriere della Sera reported.